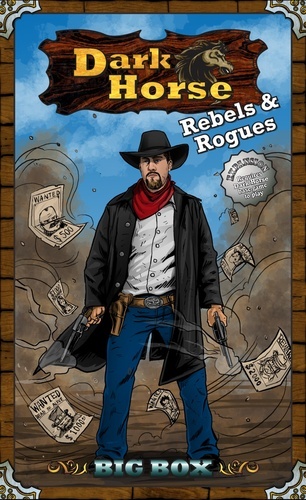 The primary focus of the Dark Horse: Rebels & Rogues expansion is the addition of a Rebel & Rogue character card deck, a Progress card deck, as well as a Hidden Agenda card deck. The overall goal of the expansion is to inject a heavy dose of historical theme into the Dark Horse game as well as offer additional game play options. The expansion introduces the concept of players having a specific Reputation. This is done through various game mechanics and cards by offering two distinct options based on Reputation tokens, i.e., White Hat or Black Hat. The Wild West was characterized by famous heroes, villains, lawmen and outlaws. Players will now be able to choose a side and hire either classic White Hat or Black Hat type characters. The good guys, called Rebels, have abilities that assist players in accomplishing goals. The bad guys, called Rogues, can harass opponents and even rob from them. Players can opt to exclude Rogues or add in a variant that allows characters to initiate gunfights and capture Rogues. Reputation adds in a thematic decision that can affect player’s options in many of the expansion variants. For example, additional Action Cards will be introduced that will have two options on them. Players will only be able to select the option that corresponds to their Reputation. So, if a player chooses to side with Outlaws then they would only have access to “Black Hat” abilities. The expansion will also offer players additional Action Cards, Player Characters, and Special Roles.